The establishment of the “C” device was one of several changes introduced by the Department of Defense in order to ensure that its medals and awards appropriately recognized the actions and service of members of all the branches of the Armed Forces of the United States while maintaining a secure bond with the rich legacy of our country’s military awards program. 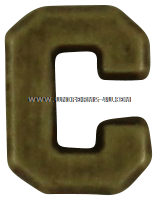 Established to recognize the dangers servicemembers are exposed to while operating under combat conditions, the “C” device is authorized for wear with certain medals that were earned while exposed to hostile action or in an area where exposure to hostile action was highly likely. But it does seem the various services seem to have tweaked the wording of the requirements for authorization of the “C” device. The Army, for example, specifies that it’s authorized only if the Soldier performed the “service or achievement…under combat conditions (while the Soldier was personally exposed to hostile action or in an where other Soldiers were actively engaged.” The Air Force Web site states that the “C” devices “was created to distinctly recognize those service members performing meritoriously under the most difficult combat conditions.” In its directive (ALNAV 055/17) regarding the new device, the Navy used much of the language found in the Army's official announcement, concluding with the statement that the "Service Member must have been personally exposed to hostile action, or at significant risk of exposure to hostile action." It would also seem the Pentagon has given the individual branches leeway in the design of the “C” device. The Air Force announced in June 2017 that it had authorized six different versions of the attachment based on different combinations of color (bronze, silver, gold) and shape (wreathed and unwreathed). An Air Force member receiving the “C” device for the first time on the Air Medal, for example, would receive a bronze “C,” but upon earning the medal a second time with the “C” device it would be upgraded to silver. A wreathed, gold “C” indicates six occurrences of receiving the same award with that device in the Air Force.